A Southwest Airlines flight was canceled Wednesday after a passenger's Samsung Galaxy Note 7 phone caught fire on board. And the owner says he already replaced his phone after the recall of Note 7 phones for the same issue. The owner of the Note 7, Brian Green, told WAVE 3 News that his phone was powering down when he put it in his pocket, and that a few seconds later he "heard a pop" and then noticed smoke "billowing" out of his clothes. "I pulled the phone out and threw it on the ground, because I didn't want it to explode in my hand," he said. "I didn't know what else to do with it." "I had a green battery indicator, which is supposed to say this is a replaced or 'known good' phone," Green told the station. Samsung was unable to corroborate Green's story when asked Wednesday. "Until we are able to retrieve the device, we cannot confirm that this incident involves the new Note 7," Samsung said in a statement. "We are working with the authorities and Southwest now to recover the device and confirm the cause. Once we have examined the device we will have more information to share." Green said his Note 7 was his third Samsung device. He said he called the company to make them aware of the situation and he was "put into a ticketing system" but has not heard more. This isn't the first report of a Note 7 replacement phone catching fire. 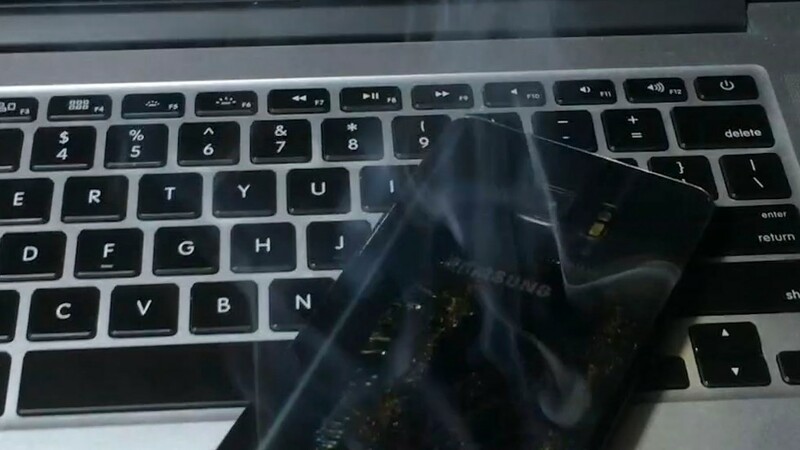 Last week, a customer in China reported that his new phone burst into flame while charging.